Milk Marketing Orders: Who Wins and Who Loses? Federal milk marketing orders (FMMO) raise prices of fluid milk products and lower the prices of manufactured dairy products such as cheese and ice cream. What effect do these prices changes have on the well-being of various groups of consumers? Do the federal milk marketing orders favor the rich over the poor? We use data from retail sales to answer these questions. The milk market is not a textbook competitive industry. Over the years, it has been affected by dairy price support programs, import quotas on dairy products, and the FMMO. For several decades, the supports, quotas, and marketing orders jointly determined farm, wholesale, and retail prices for processed fluid milk and manufactured products. We look at a period, 1997-1999, when milk marketing orders were the main policy affecting dairy markets. Many states are covered by the federal milk marketing order system. Four states have their own milk marketing orders; however, only Virginia’s and California’s orders completely replace federal orders. The most striking feature of milk marketing regulations is they allow the industry to engage in classified pricing, where milk used in various products sells for different prices. During the period we studied, separate prices were set for Class I milk used in fluid beverage products; Class II milk used in soft dairy products such as ice cream, cottage cheese, and yogurt; Class III milk used in hard dairy products such as butter and cheese; and Class III–A milk used to manufacture nonfat dry milk. By allowing the industry to set different prices for various uses, the milk marketing orders essentially allows the industry to price discriminate. Were it not for the FMMO, all milk would sell for a single price at the farm-level. The Federal Agriculture Improvement and Reform Act of 1996 mandated reforms to the FMMO program, changing how the minimum prices paid to farmers were determined. We study the transition period, 1997-1999, immediately following the passage of this law. To determine the effects of the marketing orders on consumers, we need to determine how consumers change their consumption of milk products in response to price changes. To do that, we estimated how the quantities of these goods demanded by consumers vary with prices, taking account of city-level demographic variables: ethnicity, home ownership, employment status, occupation, age and number of children in the household, education and age of household heads, and income (Chouinard et al., 2010). The estimating model uses Information Resources, Incorporated retail grocery scanner data of weekly city–level purchases of dairy products matched with demographic characteristics of the purchasing households in 22 cities, where we adjusted the prices for taxes. We simultaneously estimated demand functions for 14 dairy products: milk (non–fat, 1% milk, 2% milk, whole), cream/creamers (dairy cream, including half and half, and coffee creamers); spreads (butter and margarine); ice cream (including frozen yogurt and ice milk); yogurt (cooking, divided into plain and vanilla yogurt, and flavored); and cheese (cream cheese, shredded and grated, American and other processed cheese, and natural). The demand functions show how the quantity demanded varies as the retail prices of the various dairy products change for various demographic groups. We find—not surprisingly—that whole milk, 2%, 1%, and nonfat milk are close substitutes. That is, if the relative prices change slightly, consumers will switch from the now relatively expensive milk to the now relatively cheap one. Although this result is intuitively appealing, earlier studies that failed to subdivide milk products as finely as we do failed to find it. Removing the FMMO would affect farm prices. LaFrance (1993), Cox and Chavas (2001), and Kawaguchi, Suzuki, and Kaiser (2003) estimated that the lower farm prices for fluid milk would lower retail fluid milk prices proportionally. These same studies find that the degree to which the increase in milk prices for manufactured milk products would be passed on to retail products varies by product, and their estimates differ slightly. Here, we used the average of their estimated retail price responses and our demand system estimates to simulate how removing the FMMO would change the quantities of dairy products demanded in response to price changes. Chouinard et al., 2010, simulated other possible retail price change scenarios as well. Next, we calculated how much consumers are harmed by a price increase or helped by a price cut using the measure of well-being that economists call equivalent variation. The equivalent variation for a price increase is the amount of income that, if taken from the consumer, harms the consumer by as much as the price increase. Thus, if the equivalent variation is negative, then consumers are worse off after the price changes. We calculated the equivalent variation of milk marketing orders for various demographic groups. Table 1 shows how the price and quantity demanded change on average across demographic groups for each dairy product when the federal milk marketing orders are eliminated. Because milk prices would fall by 15.5%, the purchased quantities of 1%, 2%, non–fat, and whole milk increase substantially. Because the prices rise for some manufactured products, the corresponding purchased quantities of these products fall, but by comparatively modest amounts. Given the estimated changes in the purchased quantities of fresh fluid milk and manufactured dairy products in the scenarios when all dairy prices change, we expect some dairy consumers to benefit and others to lose. Table 2 shows the simulated equivalent variation effects, in dollars per week, across several demographic groups when we hold all but the specified demographic variable fixed at their sample means. All but the wealthiest consumers would benefit from eliminating the FMMO—that is, their equivalent variation is positive. The first row of Table 2 shows that the price changes from removing the FMMO would help the average household by the same amount as giving them an extra $2.94 per week. The next two rows show that the equivalent variation is $2.96 for a white household and $2.10 for a nonwhite household. That the welfare effects of changes in dairy product prices vary with the race of the household may be due to varying incidences of lactose intolerance. In the United States, the occurrence of lactose intolerance (nutrigenomics.ucdavis.edu) is, at 5%, relatively low for Caucasians of northern European and Scandinavian descent—although it spikes to 70% for North American Jews. Lactose intolerance is much higher for other ethnicities: 45% for African American children and 79% for African American adults, 55% for Mexican American males, and 90% for Asian Americans—98% for those from Southeast Asia. Not surprisingly, families with children younger than six years of age that consume large quantities of milk have a much larger benefit, $3.88 per week, than families with no children, $2.83. The equivalent variation falls with income from $3.84 for the poorest households with incomes less than $10,000, to -$0.92 for households with incomes of over $90,000. Consequently, as the next to last row shows, a family with a relatively low income of $20,000 and three children under the age of six that rents its dwelling, benefits substantially, $5.77, from eliminating federal milk marketing orders. Finally, our simulations show that FMMO regulations are highly regressive. We define the regulatory burden of the FMMO program as a household’s annual equivalent variation from removing the marketing orders divided by its annual income. That is, the regulatory burden is the share by which a family’s effective income would rise from eliminating the federal marketing orders. 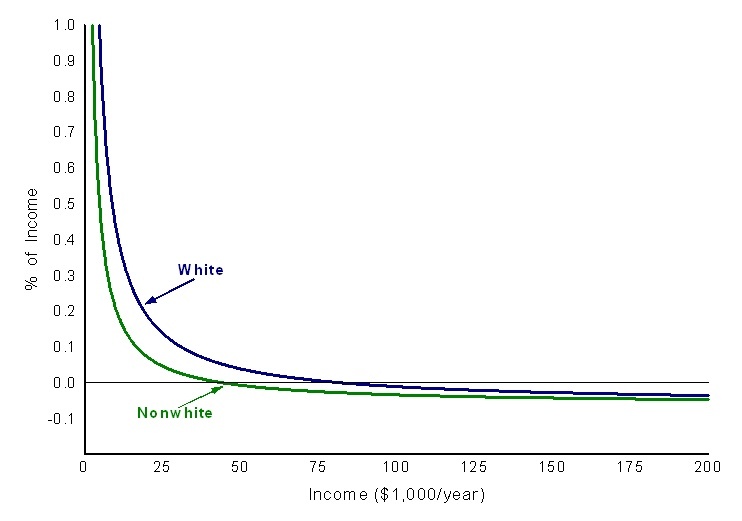 Figure 1 compares the regulatory burden as a function of income for white and nonwhite families. The equivalent variation of removing the marketing order is positive at low incomes—consumers benefit from removing it—so there is a regulatory burden (loss) from imposing the federal marketing orders for milk. For white families, the burden falls from 0.61% at an income of $7,500, to 0.44% at $10,000, 0.19% at $20,000, 0.11% at $30,000, 0.04% at $50,000, and 0.01% at $75,000. At higher incomes, the burden is slightly negative, ranging from –0.002% at $85,000 to –0.04% at $200,000. 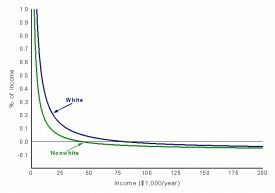 The curve for nonwhite families lies strictly below that for white families, although both curves fall with income. At $7,500, the regulatory burden of a nonwhite family is about half that of a white family. At the average real income, $25,000, the regulatory burden is about one-third for the nonwhite family as for a white one. Perhaps this difference has to do with higher rates of lactose intolerance among nonwhites. As this set of articles concerns competition and antitrust, we briefly examine how marketing orders affect competition. During the Great Depression when dairy marketing orders were first instituted, some people justified them as a response to bottling plant monopsony—a single buyer—or oligopsony—a small number of buyers. Even if that was once true, this justification is no longer plausible. Moreover, ameliorating the problems of monopsony by imposing costs on consumers cannot be the optimal response. As the FMMOs raise the average price to consumers, they effectively create the same harm as a monopoly or oligopoly. The federal milk marketing orders raise the retail prices of fluid milk products and lower the prices of some manufactured dairy products, raising the average price of milk across all dairy products. The loss from the federal milk marketing orders is equivalent to a loss of income of $2.94 per week for the average household, or $152.88 per year. Given that there are roughly 100 million U.S. households that buy dairy products, the total harm to society is approximately $15.3 billion. Thus, the federal milk marketing orders disproportionately harm the poorest members of society—the proverbial widows and orphans—by raising fluid milk prices, and benefit the richest by lowering the prices of such goods as triple cream cheeses. Berck, P., and Perloff, J. M. (1985). A dynamic analysis of marketing orders, voting, and welfare. American Journal of Agricultural Economics, 67(3), 487–96. Chouinard, H. H., Davis, D. E., LaFrance, J. T., and Perloff, J. M. (2010). Milk marketing order winners and losers. Applied Economic Perspectives and Policy, 32(1), 59-76. Cox, T.L. and Chavas, J.P. (2001). An interregional analysis of price discrimination and domestic policy reform in the U.S. dairy industry. American Journal of Agricultural Economics, 83(1), 89-106. Kawaguchi, T., Suzuki, N., and Kaiser, H.M. (2001). Evaluating class I differentials in the new federal milk marketing order system. Agribusiness, 17(4), 527–538. LaFrance, J.T. (1993). Weak separability in applied welfare analysis. American Journal of Agricultural Economics, 75(3), 770–775. LaFrance, J.T., and de Gorter, H. (1985). Regulation in a dynamic market: The U.S. dairy industry. American Journal of Agricultural Economics, 67(4), 821–832. a The heads of household are 35 years old, they have a real income of $20,000, the wife is not employed, the husband works in a nonprofessional occupation, they have three children under six years of age, and they rent their dwelling. b The heads of household are 30 years old, they have a real income of $60,000, both are working professionals, and they own their dwelling. Hayley Chouinard (chouinard@wsu.edu) is Associate Professor, School of Economic Sciences, Washington State University, Pullman, Washington. David E. Davis (David.Davis@sdstate.edu) is Assistant Professor, Economics Department, South Dakota State University, Brookings, South Dakota. Jeffrey T. LaFrance (jtlafrance@wsu.edu) is Professor, School of Economic Sciences, Washington State University, Pullman, Washington. Jeffrey M. Perloff (jperloff@berkeley.edu) is Professor, Department of Agricultural & Resource Economics, University of California, Berkeley, California.